Electric riding lawn mower and emission free riding lawn mower. That’s what the revolutionary new Riding RECHARGE MOWER™ is all about. making your lawn truly green. With up to 3 hours of continuous operating power between charges, there is more than enough power to complete almost any residential yard and it does this with NO GAS, NO OIL, ZERO EMISSIONS and VIRTUALLY NO MAINTENANCE. The 27” wide cutting path is designed to hit the “sweet spot” between traditional walk behind and riding models. This size also allows the Recharge Mower™ to pass through an average fence gate for convenient access to front and rear yards. The included bagger detaches easily for quick emptying and is positioned in the rear to improve maneuverability and maintain the compact size. 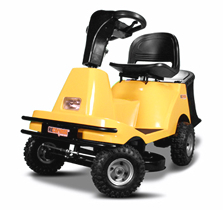 The Recharge Mower is virtually maintenance free and has been engineered for easy operation by almost any adult, whether physically fit or mobility challenged. To re-energize, simply plug into a standard wall outlet overnight and for only pennies you are ready to go again. 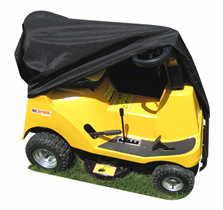 Protect your Recharge Mower™ from the elements. Slips over your current seat for added padding and storage. 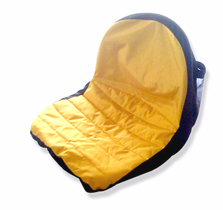 Padded for a more comfortable riding experience.